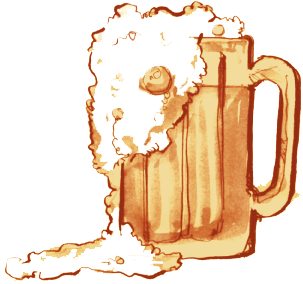 The Atlantic's How to Stop Beer From Foaming: Hint, it involves science and magnets. Fast Company's Creative Beer: Again, science. The optimal BAC for creativity is .075%, so an ad agency made a beer and a bottle with a guide to help you get there. The Ho-Ho-Honut was invented: A Christmas dinner donut filled with sausage and onion gravy, dusted with turkey salt and a roasted potato crumb finished with smoked maple candied bacon and a cranberry glaze. Food and Wine's What It's Like to Drink Sriracha Beer: The summary, "Rogue Sriracha Hot Stout Beer, from its packaging on down, is an inspired and well-executed experiment." In the last month, I've managed to make four recipes I found at maangchi.com. Originally, I was just trying to figure out what to do with a nearly full tub of koren hot pepper paste (gochujang) leftover from a recipe I tried months ago. I was immediately smitten by her. The recipes all looked great and she made cooking korean dishes seem easy despite all of the "exotic" ingredients. 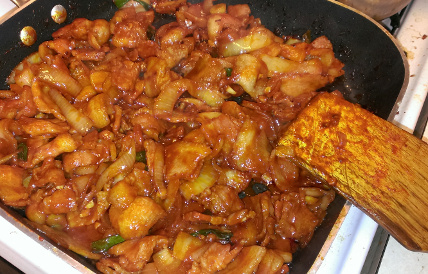 After my first success with Spicy Braised Chicken (Dak-bokkeumtang), I ventured further into the site and found several other recipes I was interested in trying, including her recipe for Spicy Stir Fried Pork (Dwaejigogi-bokkeum). 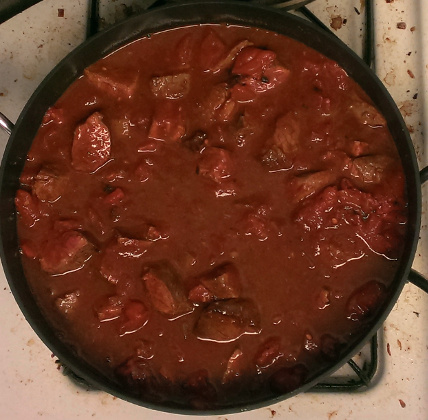 Having had all of the ingredients on hand except pork belly, I substituted that with bacon and called it dinner. A few weeks back I made Roasted Tomatillo Chicken Enchilada Casserole from Pinch of Yum. It taught me that roasting green chiles is flavorful and delicious. 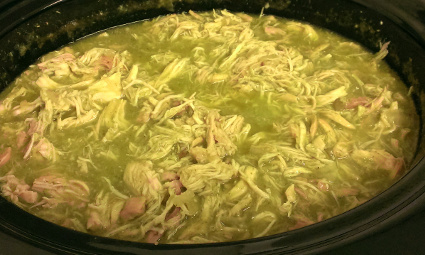 So, when I saw a recipe for Slow Cooker Chile Verde on a forum, it went on my immediate "to make" list. Read More to see the recipe. 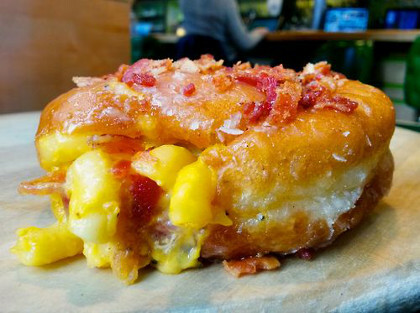 Making the internet rounds today is the recently conceived Bacon Mac and Cheese donut, currently available at PYT in Philadelphia. Described as "Warm glazed donut studded with cheesy, bacon-y mac & cheese, topped with crumbled bacon", I'm ready to eat 8. Have an ambulance on standby. 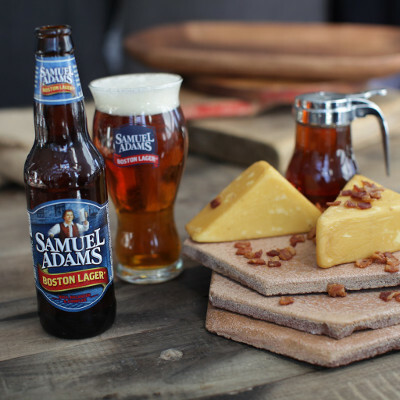 Just in time for the holidays, Sam Adams teamed up with Beecher's Cheese to create 4 easy soaked cheese recipes. 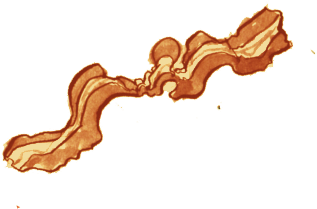 Each of the recipes has a place here, but only Bacon and Beer Soaked Cheese holds a special place in my heart. Read more to see the recipe. I tried yoga once. It was the longest single hour workout I've ever done. On Monday nights at the Quest Brewing Co in Greenville, SC, they do things a bit differently with their Hatha & Hops class. I'm not sure if that hour would have seemed longer knowing I had to wait for that beer, or whether that hour would have flown by with the anticipation of a delicious reward for finishing the workout. No doubt I'd give yoga one more try should Hatha & Hops find its way to Los Angeles. Spoiler alert, Jimmy Fallon wins. Note to the producers: this was pretty boring television. The beneficiary of my baking really likes the combination of raspberries and chocolate. 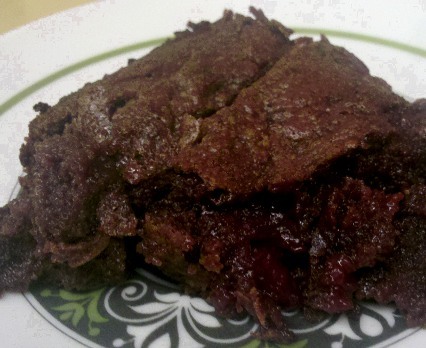 After searching online for baked good ideas using some sort of beer, I came across these Cherry Lambic Brownies at Oh My Veggies. The modification was obvious - it's raspberry season, so substitute the cherries for fresh raspberries, and use raspberry lambic instead of cherry. The results were quite satisfying!